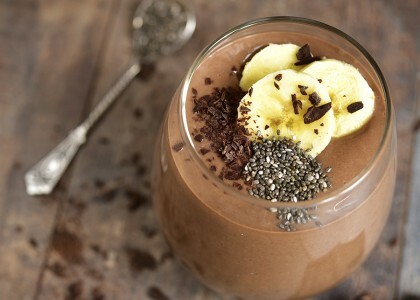 This recipe for a Banana Cacao Smoothie could also be considered a vegan superfood smoothie. There is no dairy and the chocolate is healthy. Cashews, which are called for in this recipe, are one of the creamier nuts and make a great replacement for any type of dairy milk or cream. 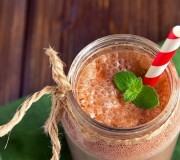 This vegan superfood smoothie also calls for cacao. If chocolate is consumed in its raw form, that form of chocolate is healthy in moderation. In fact, many people consider raw chocolate to be a superfood. Place all ingredients, except cacao nibs, into a high-powered blender like a Vitamix. Start on low and then gradually take to high and run for 1-3 minutes or until the ingredients are completely blended. Serve and garnish with a banana slice (optional). Every sip of this Banana Cacao is super creamy and chocolatey. 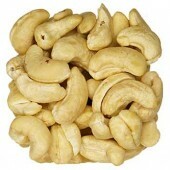 There is a lightness to the shake although the chia seeds and Eatnuts.com Cashews make it very satiating and creamy. This smoothie has the perfect amount of sweetness from the banana and agave balanced by the bitterness from the cacao. This lovely drink is very refreshing yet satisfying to a sweet tooth at the same time. The combination of the mint and cacao almost make you feel like you are drinking a peppermint patty! 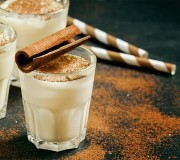 Around the holidays as people begin to drink egg nog you may ask, is eggnog healthy? If you choose to indulge in a vegan egg nog or dairy free egg nog, chances are you are having a healthy egg nog. You may ask why dairy free? First and foremost, not everyone can digest dairy, so when you offer dairy free you make enjoying the egg nog available to everyone. 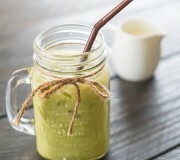 Matcha is high in antioxidants and can be used to make a delicious Matcha Almond Milk. This recipe is dairy free and can easily be turned into an iced matcha latte or flavored matcha latte recipe.